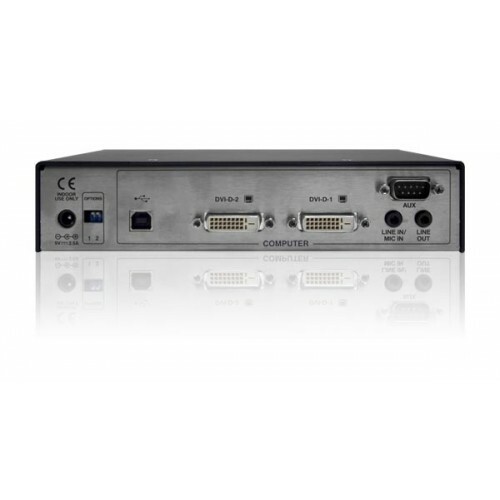 ADDERLink INFINITY FX is a dual head (2 x 1920x1200), dual link (1 x 2560x1600) DVI KVM extender over fibre. Delivering DVI and bi-directional USB, Audio and RS232 across distances up to 10KM with no loss of compression and minimal lag. The ADDERLink INFINITY FX comes with a choice of single mode or multi-mode fibre modules to suit your specific application. 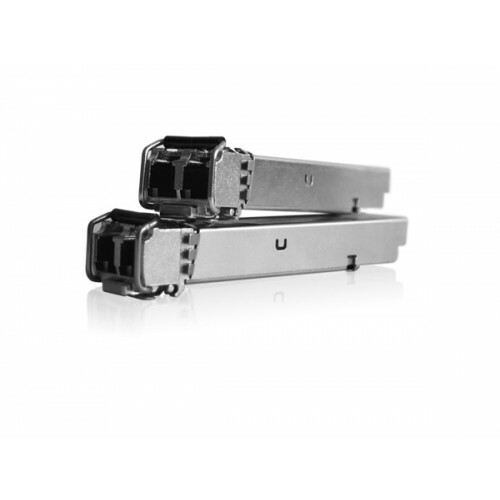 The ADDERLink INFINITY FX comes with integral SFP cages which allows you to simply plug in fiber optic transceivers suitable for your application. There are two choices available, a Multi-mode or Mono-mode , both 4.25Gbps rate selectable with LC type connectors suitable for up to 500 Meters (Multimode) or 10KM (Single mode). 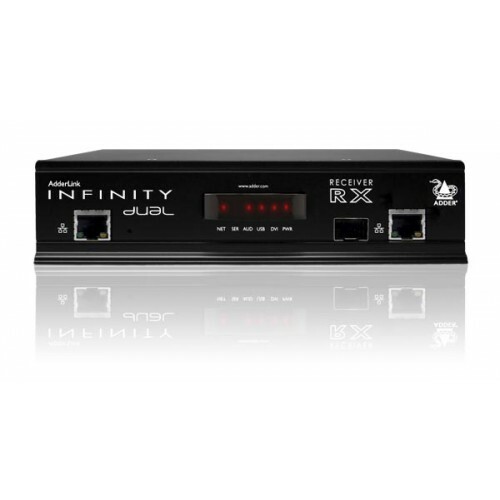 ADDERLink INFINITY FX features two single link or a single Dual link. DVI delivers native digital video signals from your computer to your digital panel without the need to convert signal types from the digital domain. By delivering native digital video you can be assured of accuracy on each and every pixel. The ADDERLink INFINITY makes use of multiple video encoding technologies devised by Adder to deliver the very best picture available. Our encoding systems are spatially-lossless, with 1:1 pixel mapping, so the digital video you receive is the same as the digital video leaving the remote computer. ADDERLink INFINITY FX uses optimal spatially-lossless compression techniques to minimise network bandwidth usage and maximise the user experience. In typical computer desktop applications, ADDERLink INFINITY FX uses remarkably little bandwidth. When it needs to deliver full screen motion video, it has the capability to process full screen moving video in real time. The received video colour is the same as the sent colour every time. There is never a loss of clarity with the ADDERLink INFINITY FX. ADDERLink INFINITY FX enables you to connect most USB devices from mice and keyboards through to graphics tablets, jog shuttles, joysticks, 3D explorers and USB flash drives. However currently Isochronous devices like web cams and USB microphones are not supported. ADDERLink INFINITY FX delivers crystal clear stereo audio digitally across the network. 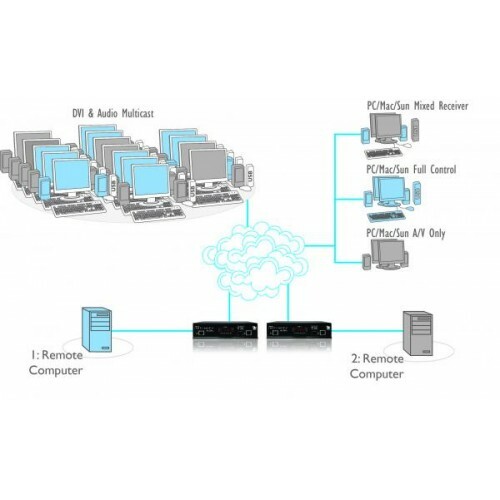 This ensures continuous fidelity and channel separation between the Tx and Rx units, or even in Multicast environments. 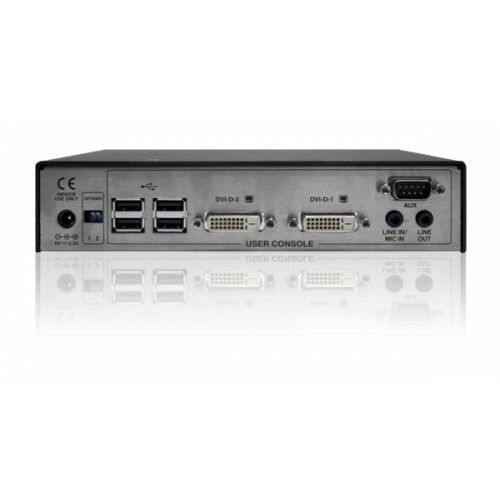 The ADDERLink INFINITY FX includes a bi-directional RS232 interface which can be used to connect devices like touch screens or industrial control equipment.